The Competition Report for the Glenview Trophy fished for on Monday evening - conditions were good and favoured both bait and fly anglers. There were 18 seniors amd 3 juniors out for this competition. In 1st place was our chairman himself Mr Philip Maguire with 3lb 3oz on bait, in 2nd place was Barry Diamond with 2lb 6oz on bait and one of these fish was 1lb 5oz, the heaviest of the year so far and in 3rd place was our best junior of the night Jason Bateson with 1lb 3 oz on the fly. So that leaves Philip on 48 points, 8 points ahead of the field at this stage. Our next competition is this Monday evening 6th June at 7pm. The Wilbert Pickering Cup is up for grabs on this occasion. If anyone is interested in a day out tomorrow the Lough Fea Open is on at 2pm. Tight lines. The competition report for the McCracken Cup fished on the 23rd of May. Once again we had another competition in high brown water to high for the fly fisherman so bait was everyones choice. We had 17 seniors and 3 juniors out this evening. In first place was Stanley Aspinal with 3 trout at 1lb 2oz in total, in 2nd place was Tommy McGrath with 2 trout at 13oz and in 3rd place was Phillip Maguire with 1 trout. Our best junior was Joseph Spiers with 1 trout. Our next competition The Glenview Perpetual Cup is this Monday evening the 30th May at 7pm. 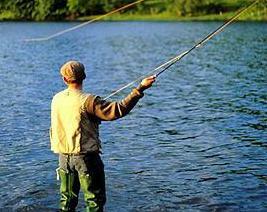 Lets hope the weather is better for the fly fishermen this time. The leader board after 6 competitions is as follows: Phillip Maguire 38 points, Tommy McGrath 36 points, Stanley Aspinal 32 points, Barry Diamond 26 points, Willie Darragh & Barney McNicholl 18 points, and Mervyn Finley with 14 points. Our best junior so far is Joseph Spiers on 14 points and Jason Bateson on 12 points. A wee trip down Memory Lane................The McCracken Cup fished on the 20th April 1985 - 1st place on this day was Sean McCormick who was a junior at that time with a 3lb 5oz trout, in 2nd place was his father John McCormick with 1lb 8oz and in 3rd place was John Clarke with a 1lb trout. Due to adverse weather conditions on Monday we can't really compare with yester years!!!!!!!! So if your worms are not in the water you can't catch any fish!!! there’d be great craic and big bags of trout. getting ready to catch quite a few. if you got Mervin – history tells its own tale! and his boat partner was soon going through hell. except Speedy’s ghillie who was now out of puff. big Jack had blanked ONCE AGAIN! for beating “Darragh” was his number one quest! how “jammie” could one person be? so he made plans with a hot cup of tea. and make sure that none got away. and Brian felt that he’d got out of jail. and Jack’s rod ended up in the bin. when your partner is in forward gear! but McGrath was in quite a huff. if he blanked he’d sure get some stick. and Speedy’s face was as hard as a stone. and big Jack will have his rod mended! Delighted for Paul Young to have finally fulfilled his life-long ambition of meeting the legend that is Tommy 'Baker' McGrath. Great PR for the club! The competition report for our first weekend away fiished at Mil Lough in Fermanagh. Fishing was very good on the Saturday but not so good on the Sunday. There was 18 anglers and a total of 43 fish caught and most of them returned. Speedy was looking good on the Saturday evening but faded out on the Sunday. He was also spotted in a boat on his own - hard to believe but buying his own boat now!!! The Francis Loane memorial cup for the heaviest fish was won by Willie Darragh with a trout of 2lb 2 oz, in 2nd place was Barney McNicholl with a trout of 1lb 12oz and in joint 3rd was Sean Henry and Philip Maguire with trout of 1lb 9oz each. The winner of the Martin O'Neill Memorial Cup was Barney McNicholl with a total of 7lb 4 oz, in 2nd place was Willie Darragh with 6lb 9 oz and in 3rd place was Philip Maguire with 6lb 4 oz. Well done to Philip. The winner of the meet at Regans Junior cup was John McKay with a trout of 1lb 2 oz - well done John. The pairs competition was won by Christie Gilmore and a little help from Willie Darragh. So well done Christie. A big thanks to Bernie and Philip for cooking the BBQ and all the cups of tea in between. We missed Joey, Patsy and Seamie D for the music this time but wee Stanely and Tom filled in on their absents. All in all a good weekends craic for everybody involved. A great weekend was had by all in Fermanagh. Thanks to Tommy once again for having everything organised. Lots of fish caught,even by Mervin. After a long discussion it was decided that the jury is still out on Death of James Mc Avoy. Thanks to Tommy, Philip, Bernie and all those who attended the weekend in Fermanagh. Another good two days of craic and friendship. Congratulations to all who featured on the scorecard. during the wake and at the Funeral. Your phone calls,texts,cards,visits etc have been very much appreciated by Bernie,myself and the extended Maguire Family. Yeah got couple of pictures of it before I returned it. Just a reminder that you should not be fishing the river until you have paid your 2011 fee and have your card. I note from the competition results that some competitors have yet to pay and should not be fishing never mind entering a competition. Hope next time you get his big brother.......I'll need to get some tips from you! well done Jason a 2lb wild brown trout on the fly in April is a fine catch for the Moyola, hope you kept a picture. Good lad Jason,I hope you took a picture of that Trout before you returned it.? Was fishing at castledawson today and caught a 2lb brown trout on the fly rod. The competition report for the Gribben House Cup and the Ulster Bank Junior Cup was fished on the 16/4/11. We had 11 seniors and 4 juniors out today and with the river in good shape for both bait and fly fishing. in first place was Tommy McGrath with 1lb 14oz on the fly, in 2nd place was Barry Diamond with 1lb 30z on bait and in 3rd place was Tom Mullen with 1lb 1oz bait fishing, so well done to Tom. 1st place in the juniors went to our first female angler Kelly Taylor to win a competition with a fine trout of 9oz - so a big well done to Kelly. In 2nd place was Jason bateson and joint third was Daniel Maguire and Joseph Spiers. Our next competition is The McCracken Cup and is the first evening out on Monday 23rd May starting at 7pm.